If you’re thinking about getting out the sun lamp to drive away the doldrums brought on by the dark mornings and earlier sunsets of fall, why not try a different kind of blues? The Blue Man Group, on tour this week at The Bushnell in Hartford, offers light – lots of it in different shapes and colors to stimulate your senses. 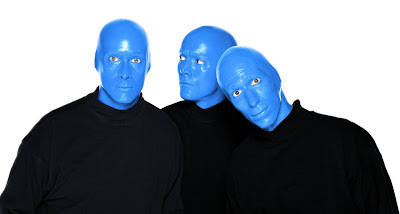 The show also features three all-blue men doing various silly gags, skillfully catching marshmallows in their mouths, drum painting and beating on various PVC pipe drum configurations amidst a backdrop of video and digital projections. Housed on the second story of the set are musicians directed by Byron Estep, who provide additional drumming and instrumentals for the electrically charged presentation. Audience participation figures in as well, as the Blue Men, who never speak, enter the house and select participants for various segments. Those seated in the first few rows in front wear plastic ponchos to protect them from paint and other messy materials that fly free during the event. Video footage of the crowd is shown and the audience gets a chance to join in toward the end of the show. Young and old seem to enjoy, but be forewarned. It’s loud. Really LOUD. The pulsating drumming will rock your seat. It’s 90 minutes with no intermission. The show, created, written and directed by Matt Goldman, Phil Stanton and Chris Wink, has tours around the country and a long-running engagement still playing in New York. At the Bushnell, performances continue tonight and Thursday at 7:30 pm, Friday at 8 pm, Saturday at 2 pm and 8 pm and Sunday at 1 pm and 6:30 pm. Tickets start at $17. Call 860-987-5959 or visit www.bushnell.org for more information.